THE CLIENT: Bard Access Systems, Inc. Located in Salt Lake City, UT 84116, Bard Access is a compassionate company which develops, manufactures, and distributes medical devices for cardiovascular practitioners who deliver chemotherapy, blood products, antibiotics, drugs, or nutrition to their patients. Bard Access also creates products of oncology treatments for management of various cancers. Bard Access was in need of a filing system which would hold and store their individual folders of filed information. They also had a limited amount of room, so they needed a shelving system that would make the most use of their floor space. Electric mobile shelving was the best solution for Bard Access. Electric mobile shelving is simple to use but looks sophisticated. Electric mobile shelving can easily store files within folders for any storage needs. Electric mobile shelving is perfect for any office setting that needs to keep records of sales and other important information. The Feature: Control key pads are located on each electric mobile shelving unit. The Advantage: Electric mobile shelving is very easy to operate for any user. The Benefit: Anybody who buys and uses electric mobile shelving doesn't need to expend much energy to move each shelving unit, and the electric mobile shelving moves quickly. Return on Investment: Less time is spent on retrieving items, since file organization is excellent, and electric mobile shelving units move side to side in a timely manner. High density moveable shelving uses modern technology to maximize storage space. Mobile shelving only takes half the space that stationary shelving uses, because aisles are not needed. High density mobile shelving condenses storage, but can be moved accordingly when a stored item needs to be retrieved. This is possible because of the rail system that guides each unit. The mobile shelving comes in two different types: mechanical or motorized. Mechanical mobile shelving has a wheel-like handle, which rotates as a user manually moves each mobile unit by hand. There is also an older style of mobile shelving with a standard handle, which has to be pushed or pulled side to side. In comparison, motorized mobile shelving operates on an electric system. 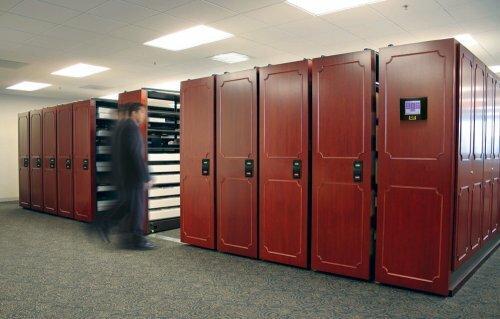 A button key pad is placed on the mobile storage system, which allows a user to move each carriage into a desired position with ease.